Crawley Town head coach Gabriele Cioffi says he cannot guarantee he will be able to control his pitchside behaviour in the heat of a match. The 43-year-old Italian has received a one-match touchline ban from the FA for accumulating four yellow cards. He was booked in his first game in charge against Morecambe in September for running on to the pitch to celebrate a goal with his players. Cioffi has also been yellow-carded for throwing a water bottle and walking outside the technical area. 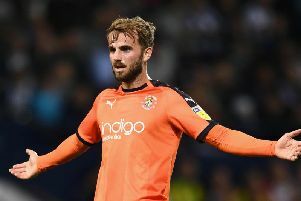 On Saturday he was booked again during their 1-0 defeat at MK Dons for his reaction to a decision to not play the advantage for a foul when Reece Grego-Cox was through on goal. He said: “The first two bookings were because I didn’t know the rules. “It’s correct, you have to have a code, I respect the code, I respect the rules but there is also room for interpretation which was missing. “I can’t say it will never happen again; you can never say never in life. “If something happens and I have the same emotion I will do the same thing again, because you can’t choke your emotion. Last Saturday at MK Dons he was booked because of his reaction to a decision not to play the advantage when Crawley were were in the opposition’s box. He said: “I didn’t agree with the decision and my action was driven by anger - I took off my hat and smashed it on the floor and it landed a few metres away from the fourth official. “It is part of my makeup to smash my hat on the floor, but it isn’t my style to throw something at an official because I respect the human being.